This online based video converter will accept files that are in 3GP, AVI, MPG, MPEG, MPE4, MOV, M4A, MJ2, FLV, WMV, MP4, OGG or WEBM format. 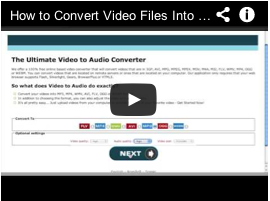 You can convert videos that are located on remote servers or ones that are located on your computer. Our application only requires that your web browser supports Flash, Silverlight, Gears, BrowserPlus or HTML5. It's all pretty easy... Convert videos by uploading files from your computer or by providing a remote URL - Get Started Now! To get started, simply read the instructions below. Below you can enter the URL of a video that is located on a remote server. Note that the URL must be of the actual video and not of a webpage that has a video embedded into it. Also make sure that the location is not password protected and that our server has access to the file. To upload a video from your PC, please use the uploader located beneath this text. To start, click on the "Add files" button, choose your file(s) and click on the "Start upload" button. Note that upload times vary and can take a while if the files are large. After the files have finished uploading, simply click the "Next" button - on the next page you will be asked to choose the video format and quality. Your browser doesn't support Flash, Silverlight, Gears, BrowserPlus or HTML5.